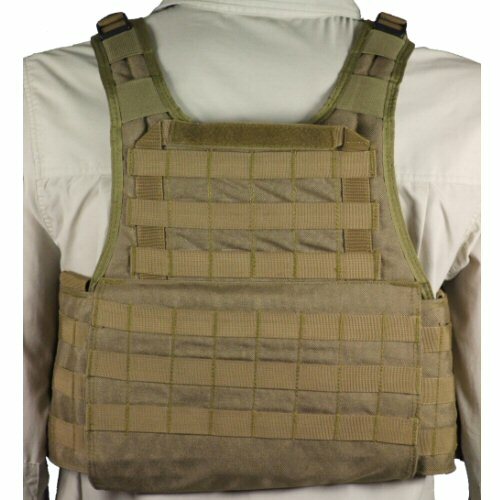 The Bulle US plate carrier with cummerbund is a medium-level armour vest with plenty of MOLLE space for carrying loads on the front, rear and sides. The plate carrier does not have to be used with the cummerbund, and can be put over a soft armour vest as a quick way of adding ceramic plate capability to existing armour when required. The plate carrier adjusts for both height on each shoulder and width on either side, and the velcro-down cummerbund also has plenty of adjustment space to allow for body size. The plate carrier can be made to transport both 10x12 inch plates and soft armour if required. The rear of the plate carrier is fitted with a large carry handle with velcro for a name tape, and the handle is re-inforced all the way down the vest for strength. The front of the plate carrier is also provided with velcro on the upper chest, allowing name tapes, nationality and blood patches to be displayed. The cummerbund may be taken off and worn separately, and has internal velcro pockets for the insertion of smaller ceramic plates to protect the side of the body, if required. 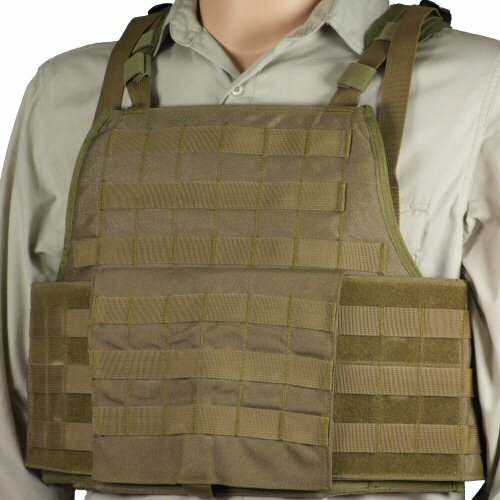 It is also provided with MOLLE for carrying loads on the side of the body. The plate carrier is made of 100D Cordura nylon, with Duraflex brand buckles and plastic furniture. All MOLLE and seams are double or triple stitched for strength, and double bar tacks secure the shoulder straps to the front of the vest. The plate carrier adds versatility to your armour or MOLLE package and is the top choice for a compromise between a skeletal load carrying system and armour carrying capability in high-speed situations requiring a lower, or variable, profile.